Multiplex chain Carnival Cinemas, a part of Mumbai-based Carnival Group, is planning to make an incremental investment of Rs 400 crore as part of its plans to open 300 screens across India by 2018, according to group chairman Shrikant Bhasi. “We have signed 50 screens in 11 districts of Kerala. By the end of 2014, Carnival Cinemas will become the largest holder of screens in Kerala,” he told Business Standard. A relatively new entrant into the multiplex business in the country, Carnival Cinemas currently operates three screens at Angamaly in kerala. 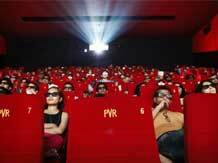 It opened a five-screen multiplex in Dindigul, nearly 50 kilometre from Madurai, on Thursday, kick-starting its multiplex business in Tamil Nadu. Considering the increasing number of film releases in Malayalam, Telugu and Tamil, the company is focusing on spreading its roots in the smaller cities in south, Bhasi said, adding that the company was planning to lead the south Indian cinema exhibition with a holding of 87 screens by the end of this calendar. Carnival Cinemas has also signed 20 screens in Tamil Nadu, which would be operational in the next six months even as it is gearing up to roll out 17 screens in Karnataka and 50 screens in Madhya Pradesh in due course. “Of the 300 screens planned across the country by 2018, 40 will come up in Andhra Pradesh,” he said, adding that the company had adopted both organic and inorganic modes of expansion to speed up the growth in the secondary markets down south.